Squash shoes are an essential piece of squash equipment. They help you move around the court, protect your feet, and are non-marking, meaning they will not leave marks on the squash court. Here are some brands of squash shoes I’ve covered so far on Squash Source. Sometimes these brands make squash-specific shoes, and other times they make shoes for other indoor court sports like handball, volleyball or badminton that also can be used for squash. What are the best squash shoes for you? Grip – do the shoes give you good traction? Durability – how well do the shoes hold up over time? Comfort – do they fit well and feel comfortable? Cushioning – how well do they protect your knees and the rest of your body? Squash Source has a large collection of helpful reviews left by readers. If you have any feedback on your current pair of squash shoes, please leave a comment about it! Has anyone been able to identify Ramy’s shoes? He’s wearing them in his latest Instagram videos but they’re taken from too far away for me to see what they are. They’re black with some white on the sides where the sole wraps around, as far as I know he’s still sponsored by Salming (He wore the Viper 5s for a few weeks then went back to his old Race R9s) but they don’t have any models out which match. Could be something new and unreleased? During the Black Ball Squash Open 2018 I got very intrigued by the shoes Mohamed Abouelghar was wearing. I follow this site somewhat closely and always try to follow what the top pros are playing with (shoes, rackets, etc) and to my surprise I could not find out what Abouelghar was wearing. It took me some digging to finally find what seems to be a new player in the vibrant squash shoes scene, named Teuton. I don’t want to be advertising it much, and I don’t know a thing about the shoes apart from their site and FB page. Youtube doesn’t seem to have a single video review so far on them (at the time I’m posting this (dec 12 2018). According to their site, it seems like Amanda Sobhy has also been signed by Teuton. Good to see new players coming in strong, more competition is always better! Good luck to Teuton! Thanks Cesar I will post about these! Ok I just posted about Teuton. Thanks for the tip Cesar! My son has just been made his own custom pair of orthotics, he is only 8 and size 2 feet, currently he wears asics but when putting them into the shoe, his whole foot became to high for the shoe, so I’m looking for a deep fitting junior shoe where the orthotics will fit, does anyone have any suggestions ?? Hmm I am not sure and we will see if anyone volunteers a suggestion on this. I am current testing out a pair of Adidas (Stabil Bounce) and they are much deeper than the Asics I wore previously (Rocket 8). I don’t know if the same would hold true of the junior Adidas shoes but you may want to look into them. Hi Steve, if you ever buy a different shoe after the Salmings, know that some Asics have removable insoles, such as the Fastballs and Blasts. Those that don’t, like the Asics Gel Rockets, are slightly glued but also removable with a bit of a tug. Cheers and best for you and your son. Yes as long as they say “non-marking” on the sole, they should be fine. At SOME courts people might give you a hard time about black soles, and this is because they are extra vigilant about not having the courts get marked up (which happened at my courts recently, it was sad) but this is rare and if you just show them the shoes are labeled non-marking, you should have no problem. I have used the salming race X/ R’s but they have been discontinued. Used the Kobra but it did not suite. Cannot find a suitable race shoe now. What is a good alternative? Is the Hawk worth trying ? If you’re looking for Race X shoes, they’re still sold online. controlthet.com has them in a couple of sizes, and they do ship internationally. I got my S-Lines from that website. As for the hawk, I’d try them. I don’t have them but they look awesome and I’ve heard only good things about them. I’m in the same boat actually. Swapped the Race X for the Eye shoes which is comfortable but I’m getting sore ankles again so might return to Salming but the new Hawk’s look totally different to the Race X.
I have been using Gel Blade 6’s since November and I love them for how light they are (I am big mover on court and travel a lot). However, they give me terrible blisters on the ball of my foot (mainly left). I think it’s from the side ways movement of the foot in the shoe. Can anyone recommend anything that might help this or some shoes that are not so wide and my suit me more? Either some insoles to grip and stabilise your feet better, or change your lacing pattern to one that increases front foot hold. (Google will know). A bit obvious, but you don’t get blister when wearing two pairs of socks. Hey can I use ascics gel solution speed 3shoes for playing squash ? The soles are non-marking, based on what I’m seeing at the link below, so technically you could use them on a squash court. That black pair actually looks pretty sweet. They are marketed as tennis shoes and I don’t know how they’d feel on a squash court. Just a thought but have you tried tennis shoes? 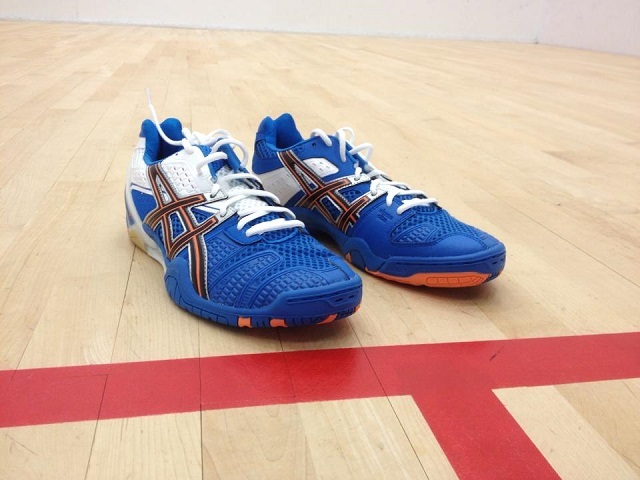 I had a friend using the Asics Gel Resolution 7 for squash (playing at a pretty high level) and they worked well. You might find that tennis shoes have thicker soles that last longer due to the harder and more abrasive surfaces they play on. Dont buy tennis shoes- they’re completely different than squash shoes, Rod is giving you bad information. Lloyd, what shoes are you buying? Generally cheaper shoes don’t last as long, so you’re just cycling through cheap shoes pretty quickly. You could try adidas stabil? Or eye shoes, I’ve heard pretty good things about both their longevities. In Rod’s defense I did see a couple pros playing with the Asics Gel Resolution 4 back in the day. But generally yeah I’d be wary of that. Are you a lefty? I’m a lefty and it’s always my right shoe that gets that hole. My righty friends who wear the same shoes as me get the hole in the same place on their left shoe. Hi there ! Great blog. I’m looking for a suitable replacement for my beloved ASICS gel Fireblast 2– I am a heavy mover and wear squash shoes especially on the inner toe side (dragger) – and suggestions would be great! Would love to replace with ASICS and have them last more than a couple of months ! I’m looking for some help with sizing. I’m planning to buy some Salmings, but am unsure what size to buy. I have Asics Gel Blast in size 11.5 and Adidas PowerStabil in size 12 (both US). Can anyone comment on which size I should go with for Salming Vipers? In my experience the Salming sizes are the same as Asics. Thanks! I just got the Salming Kobras (not Vipers as I originally said) and 11.5 seems like the right size. Can’t wait to try them out on the court. Does anyone know how is the sizing of asics shoes compared to salming or Adidas? I bought adidas and salming shoes before in size 11.5 US and they fit perfect for me. I don’t like Adidas new shoes and salming are too pricey, so I want to try some Asics but i only find them online. I appreciate a lot your comments. In my experience they tend to fit true to size. Adidas tends to fit narrower than Asics and Salming based on the models I’ve worn in the past. I’ve worn Stabil 11s, Salming Race R1 and Asics Fastball 2, Blast 5, Gel Squad and Rockets. True except for the Salming Kobras. From experience you need atleast a half size bigger in Kobras then you do with Asics. I’d love to know if anyone has insight on this! I’m trying to work on hard low lunges to the front and sliding can be a useful tactic, but I seem to slide only randomly in my shoes at the moment. Even if you are flexible enough, sliding into a deep a split is not very effective as you get trapped, much better to go into a deep forward lunge imho; sliding sounds dangerous. All squash shoes are designed to NOT slide, otherwise you have no purchase when you push off and lose speed and energy. Also, if you are deep lunging for a ball, as you should and the foot slips away, you could be in big trouble, That’s why they mop up any sweat on court. Squash is not tennis. Interesting, I had never heard of those. I don’t know if they would be any good for squash. They seem to be made for CrossFit and those types of workouts. Here are some Metcon 3s with what look like non-marking soles. Will see if anybody that has tried them has a comment! 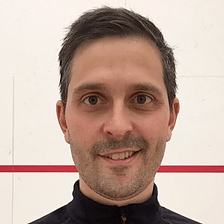 I tried the Minimus 40 trainer from New Balance – although it has a Vibram outsole that appears to be very similar to most court shoes, it did not grip well on the squash court and I ultimately returned them. Not sure if many training shoes have a good of ankle support as most squash shoes. what shoe will give best cushioning ? tried the asics gel rockets but found them lacking .I was thinking of something like addidas stabill boost 20y but i am finding it hard to source them . any suggestions ? You might want to give Mizuno a try. Last season I used the Mizuno wave stealth 3 and it felt like I was walking on trampolines, I kid you not. They are one of the heaviest shoes around, but given my total body weight, I’d say they’re pretty light.